Does Black Elderberry Syrup Fight Cold and Flu Viruses? 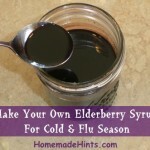 You are here: Home / Health / Does Black Elderberry Syrup Really Fight Cold and Flu Viruses? I started taking Black Elderberry Syrup during the winter a few years back. Why? Because I heard it was good for fighting cold and flu viruses. But I don’t remember the source and if it was based on hearsay or scientific facts. So I did some digging and looked for scientific-based research for proof that black elderberry is indeed a virus-killer. If you do a search for black elderberry benefits, you will find a myriad of blog results telling you how awesome it is, but very few will cite scientific sources. So I did some deeper searching and found several peer-reviewed scientific journal articles about black elderberry health benefits with statistically significant results. European Black Elderberry (Sambucus nigra L.)is a shrub that is found across Europe, central and western Asia, and northern Africa. It is important to note that there are Sambucas species in the U.S. and throughout North America, such as American Elder (Sambucus canadensis) and Blue Elderberry (Sambucus cerulea), but they are obviously not the same as Black Elderberry. Do all Black Elderberry species have antiviral properties? Perhaps, but all the studies have tested Black Elderberry (Sambucus nigra L.) so I can’t say if other elderberry species will have the same properties. Warning! DO NOT EAT RAW ELDERBERRY BERRIES. Raw and unripe fruit (as well as other parts of the plant) contains a cyanide-like chemical. Berries must be cooked. Black elderberry has been used medicinally for centuries. The berries contain high levels of antioxidant bioflavanoids and anthocyanins with natural antiviral properties, especially against the flu virus and certain strains of bacteria. But don’t just take my word for it. Here are a few clinical studies that have proven Black Elderberry’s efficacy. Study: Inhibitory activity of a standardized elderberry liquid extract against clinically-relevant human respiratory bacterial pathogens and influenza A and B viruses (article). This study not only supports that black elderberry inhibits growth of both influenza A and B viruses, but also against against three Gram-positive bacteria and one Gram-negative bacteria that cause upper respiratory infections: Streptococcus pyogenes and group C and G Streptococci, and the Gram-negative bacterium Branhamella catarrhalis, respectively. 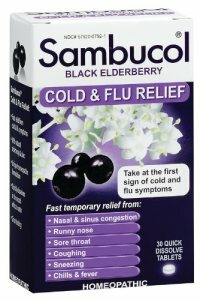 Study: The effect of Sambucol, a black elderberry-based, natural product, on the production of human cytokines: I. Inflammatory cytokines (article). This study is particularly interesting because it examines not just black elderberry, but a popular product called Sambucol, a black elderberry extract syrup. Sambucol was shown to be effective against 10 strains of influenza virus and reduced the duration of flu symptoms to 3-4 days. Study: Randomized study of the efficacy and safety of oral elderberry extract in the treatment of influenza A and B virus infections (article). This study tested the efficacy of elderberry syrup for treating influenza A and B infections. Patients who took 15 ml of syrup 4x a day for 5 days had an average relief of flu symptoms 4 days earlier than the placebo group. There are many more studies that have similar results. So now I am satisfied that taking Elderberry Syrup to fight against viruses is effective and not just a hearsay herbal remedy. Reduce the duration and severity of flu symptoms (if taken at the onset of symptoms, within 48 hours or less) including nasal and sinus congestion, runny nose, sore throat, coughing, sneezing, chills and fever. Fight upper respiratory bacterial infections caused by 2 types of Strep bacteria as well as the Branhamella bacterium. How Do You Take Black Elderberry To Shorten Cold and Flu Viruses? The common method of taking Black Elderberry is in syrup form which contains a Sambucus nigra L. extract. It is also available as lozenges and can be taken as tea (steeping elderberry flowers), but since studies focusing on the liquid extract, that is what I prefer to take. Note that elderberry is not a cold and flu preventative. It is a treatment and homeopathic remedy that reduces symptom severity and duration of illness. So only take it when you start to feel like your are coming down with something. At the onset of symptoms (within 48 hours), adults take 2 teaspoons (10 ml) four times a day; children take 1 teaspoon (5 ml) four times a day. What Should I Look For In A Product? For example, Nature’s Way Original Sambucus Extract is standardized to BioActives from 6,400 mg of cultivar elderberries and provides a guaranteed potency of flavanoids, including anthocyanins. Sambucol is standardized to 38% elderberry extract for adults and 19% for children. They state that there are 1,000 elderberries in a 4-ounce bottle. I have found the best price for both products online at Amazon (follow above links). Most of the studies I have read have focused on flu viruses, not cold viruses, so as of today I cannot say whether it will have the same effect on colds. I know it doesn’t hurt to take elderberry (it’s an immune-booster) so when I start to have cold symptoms, I always take the syrup right away. Since I have been using elderberry syrup, my colds never last as long as they did before, so I will definitely continue to use it. I like it much better than using Zicam (zinc lozenges) which offers a similar treatment, but has side effects such as upset stomach. On the other hand, I have experienced no side effects from taking elderberry syrup. After all, it’s just fruit! Bottom line, it’s a great drug-free alternative to OTC cold and flu medications for both adults and children. You can purchase Sambucol or Nature’s Way Sambucus in several forms and varieties for both adults and kids: syrup, lozenges, quick-dissolve tablets and more. If you have a cold, sinus infection, allergy or just simple nasal congestion, take a look at how a Neti Pot can relieve your symptoms. You can also make your own elderberry syrup to relieve cold and flu symptoms with just 3 ingredients! 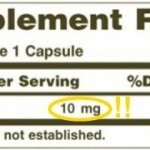 Warning: Are You Taking Melatonin As A Sleeping Aid? You Shouldn't. Here's Why. I just read about this product. I have had the flu since Wednesday. I started taking the elderberry today. I actually feel better. Is it okay to keep taking it. I had fever of 102. Now 99. Jan – One study had patients take the syrup 4x a day for 5 days which help reduced symptoms and duration of the flu, so you could continue to take it for at least that amount of time. Just started taking today. Had a virus infection for five weeks and is not clearing, severe cough and lots of phlegm all the time. Informative article. I have 6 in my family and every time the flu would be going around school or if my kids got it I would take elderberry extract. I haven’t had the flu in over 10 years. Now my whole family takes it at early warnings. L. The L. does not formally indicate laciniata, it is for Carl Linnaeus, he is founding father of binomial nomenclature- the 2 name system of scientific naming of organisms and plants. The 1 letter initial is to give the initial indentifying person recognition. Carl Linnaeus is the primary identifier for 3,000 plus taxa. I had a very nasty cold. I started to use the extract from the beginning. Now I am in third day and most of the symptoms are gone. Glad you’re feeling better, Al. We always have either a bottle of Sambucus or Sambucol or a batch of homemade elderberry syrup around in our house just for that reason. At what age can children take the Sambucol? 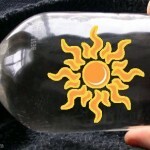 Carla – Sambucol for Kids is specially developed for use by children ages 2-10. Nature’s Way Sambucus for Kids can be given to children ages 1-12. Love all the scientific information on black elderberry syrup I like Nature’s Way Sambucus. I’ve had the flu for 7 days, and am just now hearing about Black Elderberry syrup. Is it to late to start taking it to get some relief. It works best if taken within 48 hours of the first symptoms. I don’t know how much relief or if it will shorten the duration of your flu at this point. But elderberries are high in antioxidants and contain antiviral properties, so as a general immune booster, it still may be helpful to take. Just a little correction for the sake of accuracy and to lessen confusion, but elderberry syrup is a natural remedy, and not a homeopathic one. The definition of homeopathy is: “a system of medical practice that treats a disease especially by the administration of minute doses of a remedy that would in larger amounts produce in healthy persons symptoms similar to those of the disease.” I think a lot of people don’t understand this. So if one of my children has the start of the flu, if it’s okay to give my other child the Sambucol gummy to build up his immune system? Or should I wait until he gets the symptoms? Should he take vit c instead? Can you take too much of the elderberry syrup? I bought the concentrated syrup. Can you do harm to your body if you take too much? The box said to only take 1 tsp daily but you can add another tsp? You wouldn’t want to take large quantities of elderberry syrup for a long period of time because of the sugar content alone. Also, some people are sensitive to the laxative effect of elderberries if taken in higher quantities. And you would need to consult with your physician to make sure there wouldn’t be any interactions with prescription drugs. Elderberries are very high in anthocyanins, a type of flavonoid and antioxidant, which is known to stimulate the immune system. There are no clinical studies that prove that elderberry extract will prevent the flu, but because elderberries are high in antioxidants, is beneficial to the immune system in general. Can you take cold medicine along with the sambucol. 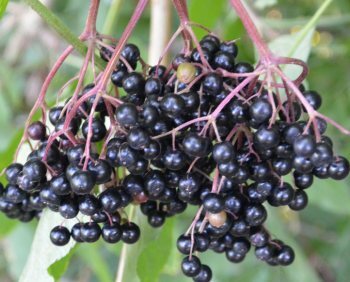 No interactions between black elderberry and other medications were identified from the published worldwide literature. As with all medical conditions, the patient should check with a healthcare professional before using any other supplements or medications. Do you need to take Cold and Flu medications ie; Codral etc. to assist Sambucol to manage your condition? Sambucol reduces the duration of your cold and severity of symptoms, but won’t temporarily relieve symptoms like cold/flu medications do. Does it help with coughs? Heather – No, not specifically. It doesn’t work like a OTC cough suppressant (dextromethorphan) or expectorant (guaifenesin) medicine. If taken at the first sign of a cold, it can help reduce the duration and severity of your symptoms, including a cough. Is the elderberry safe for nursing moms? Jennifer – Can’t find any conclusive data on whether or not elderberry is safe for nursing moms. In fact drugs.com says, “No data exist on the excretion of any components of elderberry into breastmilk or on the safety and efficacy of elderberry in nursing mothers or infants.” I see one article that lists these fruits to avoid during breastfeeding: grapefruit, lime, cherries, prunes, kiwi, and strawberry. I seem to get colds , flu, starting in early October and lasting, off and on, until late spring. Is it safe to take elderberry at least once a day for that length of time. Can it be taken on a daily basis to help boost a low immune system? Elderberries contain anthocyanidins which have immunostimulant effects and therefore beneficial to the immune system.